Neck and shoulder pain is one of the most common reasons why people consult their GP, physiotherapist or chiropractor. Most GPs prescribe painkillers to help with the pain. Whilst physios and chiros will perform manipulations to provide temporary pain relief. However, the issue will continue to persist in the long run if you do not do something to address the root causes. So, instead of looking for quick fixes all the time, read out blog to find out the root cause of your should and neck pain and the best solutions to deal with it. If your neck, shoulders or traps hurt, unless you have been involved in an accident or a fall, it is most likely due to your posture. Pain usually comes from soft tissues such as muscles, tendons, ligaments or fascia being pulled in an abnormal way and being strained. The most common upper body postural issue is called the upper crossed syndrome. The upper crossed syndrome refers to a postural condition that includes a forward head, rounded shoulders, a hunched upper back or thoracic kyphosis, and a depressed sternum. It is caused by muscle imbalances between neck, upper back and chest muscles. More specifically, tight upper abdominals (the famous “six-pack”) and pectorals will pull the shoulders and sternum forward and down, while the upper - mid back muscles and deep neck flexors are weak and lengthened. This position will lead to abnormal sharing of the load between your anterior and posterior muscles. This is likely to cause muscle strains or spasms and will result in pain in the neck tissues, upper trapezius at the top of your shoulders as well as in the muscles around your scapula. In addition, having protracted shoulders will disrupt the optimal functioning of the shoulder and can lead to impingements. Moreover, if you play any sports that includes a lot of shoulders rotations or overhead movement, such as tennis or swimming, you are very likely to get tendons or ligaments injuries. 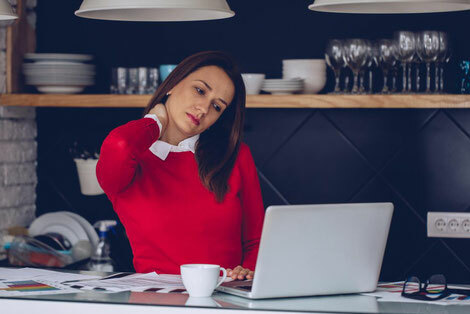 On top of neck and shoulder pain, this posture could also cause headaches, pain in the jaw, numbness and tingling in the arms or hands, rotator cuff injuries, as well as herniated disks or pinched nerves. Working at a desk is a common cause of neck and shoulder pain. Now, how do you end up with this posture? The more time you spend in a poor position, the more likely you are to get stuck in that position. There are many reasons, and most are caused by lifestyle factors. It’s also important to realize that the longer you have had this poor posture, the longer it will take to reverse it. Changing a habit that you have had for a long time is difficult because of what we call the law of facilitation. “When an impulse has passed once through a certain set of neurons to the exclusion of others, it will tend to take the same course on a future occasion, and each time it traverses this path the resistance in the path will be smaller1.” In simpler terms, the more your nervous system uses a certain pathway, the more likely it will use it again. And every time it takes this pathway it becomes easier and easier to continue repeating that same path. So the more you do something, the easier it is to continue to do that same thing over and over again and the harder is becomes to resist it and change the pathway. That being said, there are still solutions and things you can implement to fix your posture and heal your pain. First and foremost you need to tweak the habits or the lifestyle factors that caused this posture in the first place. Change your pillow or your sleeping position. Avoid big pillows that will raise your head up at night, this will only exacerbate your forward head posture. In addition, avoid sleeping on your side and prefer sleeping on your back. For more details, we talked about proper sleeping position in this article. Modify your sitting position at your desk. You probably spend most of your day time at work, sitting at a desk in front of a computer. Make sure your seat has proper back support and forces you in an upright position instead of a hunched back position. Your computer screen position also has a big impact. Your screen should be at eye level to keep your head upright instead of forcing you to look down. If you use a laptop, the best solution is to have a separate screen or keyboard. You also want to make sure your keyboard and mouse are at your elbows level. And if you spend a lot of time on the phone, get a handset to avoid spending most of your time with your head bent to the side. Avoid looking down at your phone or tablet. If you look around you in the MRT at peak hour, you will see most people on their phone, their head looking down and their neck forward. Hold your phone higher or simply try to spend less time on your phone. The news, your work emails or social media can be a source of great stress that you definitely want to reduce. Which leads me to the next point. These are two examples of the proper desk ergonomics that will help fix bad posture. Reduce your overall stress. Your upper trapezius, located across the top of your shoulder is one of the “stress muscles”. It is very common for people to tense this muscle when they feel stressed. When you go for a massage, how many times has the masseuse told you that you are tight in that spot, and had to spend very long and painful minutes massaging this area? In addition, a poor breathing pattern, that can also be created because of stress will also exacerbate the tightness. Indeed, most people tend to have a shallow breathing, breathing mostly with their chest and neck. With a proper breathing pattern, your belly should rise first and then, your chest. This allows your lungs to expand and be fully filled with oxygen. Being properly oxygenated will do wonders for your energy and your stress levels. Avoid carrying heavy bags on one shoulder, whether it’s a handbag or laptop case. Do you feel your neck or shoulder pain only one side? Have you ever noticed that one of your shoulder is lower than the other? Although, there could be other postural reasons for this (uneven pelvis, or scoliosis to name a few), holding a heavy bag for several hours a day on one side could explain it. Either try to switch sides regularly and avoid carrying your bag on the same shoulder all day, or if you can, switch to a backpack to even the load on your shoulders and back. In general, try to reduce the load you are carrying all day, it will definitely benefit you. Now, even if you have changed your seat and your computer screen position at work, or are now sleeping on your back, you might still find it difficult and tiring to keep yourself upright at your desk and might feel uncomfortable lying down your back in your bed. In addition to changing what caused this posture in the first place, stretches and strength exercises will help pull your body back in a proper posture. As I explained previously, some muscles are too tight and others weak and lengthened. In this case, you will need to stretch what is tight and strengthen what is weak, with a focus on endurance more than maximal strength. The neck is a complicated system of push-pull. 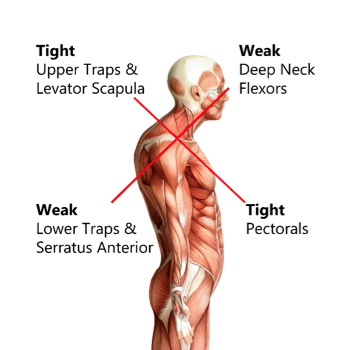 You will need to focus on stretching these muscles: suboccipitals, anterior scalenes, sternocleidomastoid, upper trapezius, posterior neck extensors. On the other hand you’ll need to use strengthening exercises for your deep neck flexors. Start by stretching your upper abdominals and pectorals. Then focus on strengthening the muscles that will pull your scapula and shoulders back in position, the lower trapezius and rhomboids. Exercises such as rows (single arm preferably), supermans or cobras are great options. 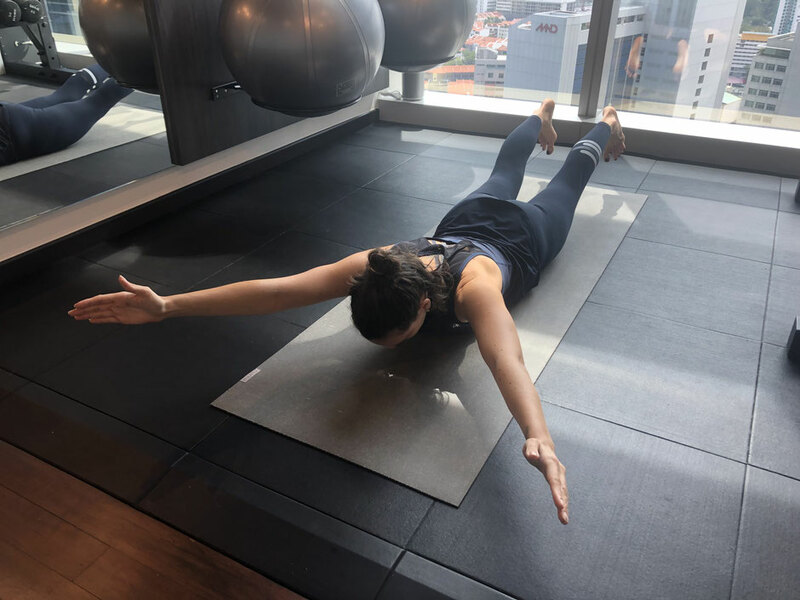 Our Personal Trainer and Corrective Exercise specialist, Elise, performing the superman - a great exercise for neck and shoulder pain. Forget the crunches! Your upper abdominals being too tight, you want to avoid strengthening them even more. Instead focus on strengthening your deep core musculature with exercises targeting the transversus abdominis. So in summary to permanently reduce the pain in your neck and shoulders you want to minimise the negative ergonomic effects in your environment and simultaneously stretch the tight areas and strengthen the weak areas. P.S. If you would like to get a Movement Assessment to see what other postural issues are connected to or causing your chronic neck and shoulder pain then feel free to give us a buzz at 6285 0185, 9634 1940 or email us info@levitise.com.sg. 1. Dorland’s Medical Dictionary 27th Ed. 1988 W. B. Saunders Co.